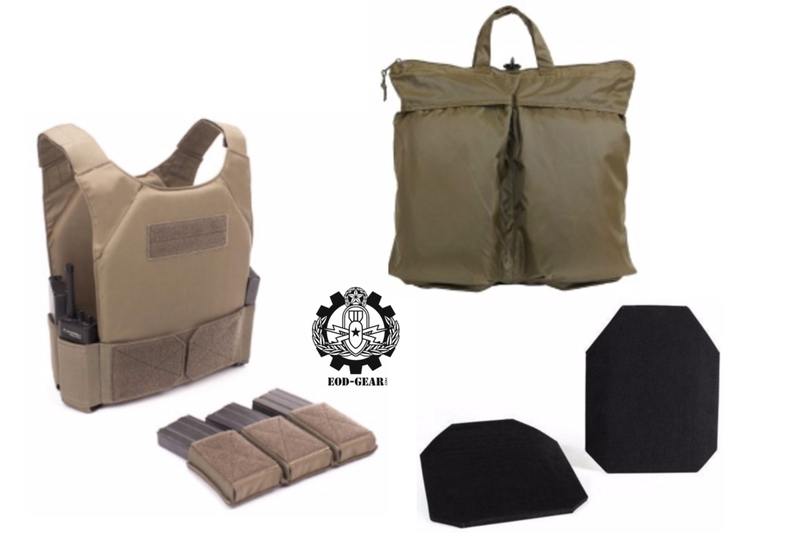 This Covert Rapid Response Level IV Armor Kit was specifically designed for Law Enforcement to keep in their cruiser to have appropriate armor, sufficient ammo and a way to keep the gear secured and protected when not in use. This is the ideal kit for active shooter scenarios. If you're purchasing quantities of this kit for a command, please request a quote for best pricing. PRO NOTE: I would set this kit up installing the plates in the carrier and then attaching the velcro mag holders to the front of the vest while the side straps are out of the way. Fold the vest over on itself so that it is inside-out. Insert the carrier into the bag. When needed, pull the vest out, place it over your head and bring the sides around attaching the hook to the loop on the front of the mag pouch to proper fit. You're now ready to rock! Warrior’s Covert Plate Carrier (CPC) MK1 is a low profile slick armor carrier designed to hold 10″ x 12″ SAPI or Shooter’s Cut Plates. The CPC is fully adjustable on the shoulders for size. The sides are made from double layer high quality U.S. Mil-Spec elastic, and incorporates 2 internal pouches on each side which can hold mag pouches and/or radio. The CPC-MK1 Combo comes with Warrior’s TVMP Triple Velcro Mag Pouch for 5.56mm mags, which attaches to the front of the carrier by means of Velcro and is then secured shut by overlapping the Velcro elements of the side elastic side sections. The sides are fully adjustable for girth by way of Velcro closure. Made from Genuine U.S. Mil Spec materials. Radio and Mags pictured are not included with the CPC MK1. MultiCam Products now available with official MultiCam approved Murdock webbing. All Fabrics, Webbing, Plastic Hardware and Threads are treated at source to deliver the lowest I.R. Signature possible. Level IV is certified to stop M4, AR, AK .308 and green tip as well as pistol. Moving to Level III+ gives you everything Level IV does but without the .308. If you've ever owned a helmet bag, you know why we chose this to carry the kit. Well padded, extra internal and external pockets for "Lickies, Stickies & Warmies." Bag will match the color of the vest unless otherwise requested.